Obviously a TNT now as this is the third skirt I have made from this pattern. No 1. I made with the fishtail (which I did get tired of) - here. No 2 adapted to remove the fishtail - here. 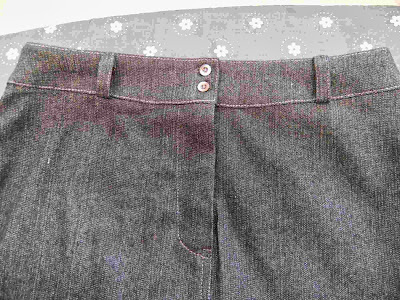 This time I made it (again) without the welt pockets and the straight skirt variation, but with the angled back pockets. My photos are on Diana but if you look at version 2 linked above you can get an idea of how it looks on me. The length is the same - above the knee. 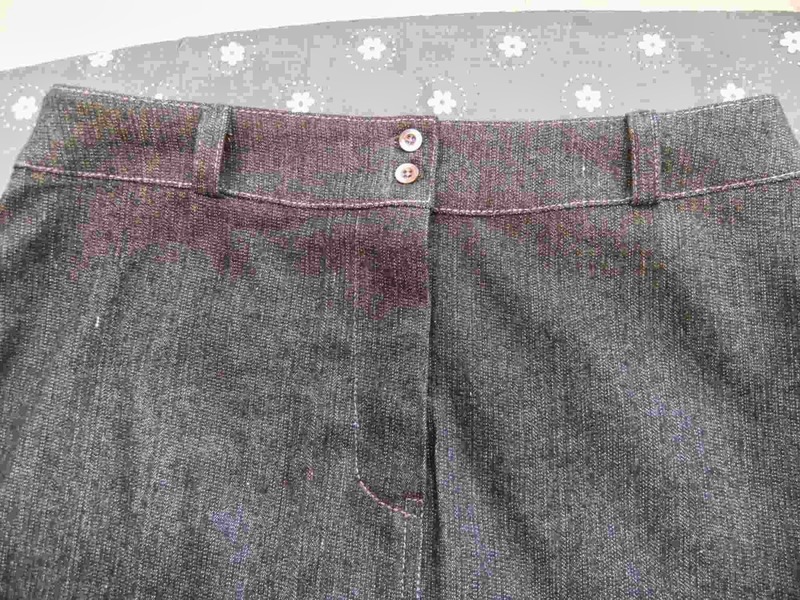 The top stitching is triple stitch using regular purple thread. I like it as it is quite subtle on the black denim. I used 2 buttons as I used to have problems with the band curling back on the corner. This time I think I got the instructions right and folded the band back on itself on the RHS. So there is more layers of fabric to hold it firm. I have to say the 2 buttons is not an original thought. I am sure I saw Anne of Gorgeous Fabrics do that with this skirt. My fly sewing has really improved from the first of these skirts! 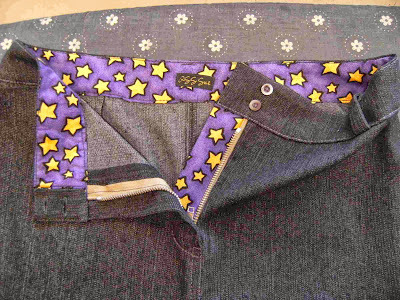 Of course I used a jazzy quilting cotton for the inside waistband and fly shield. 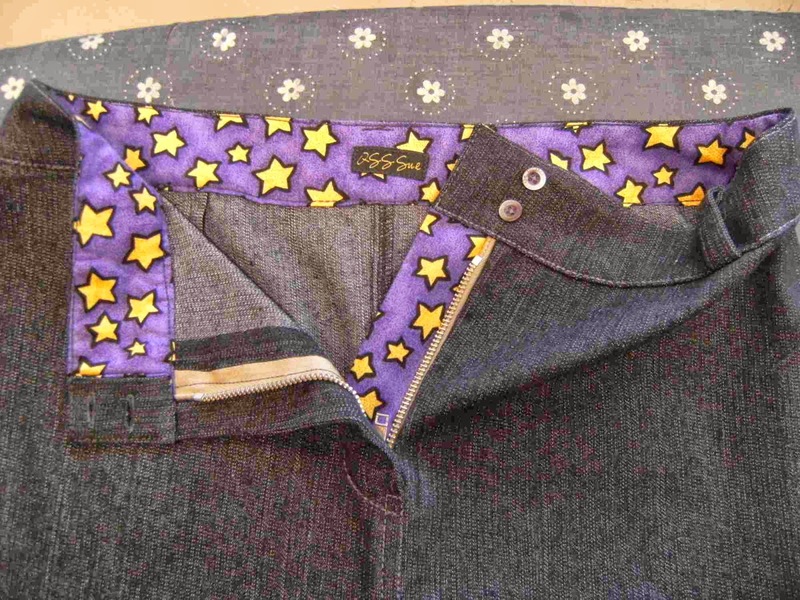 The zip doesn't match in colour and is an inch shorter than recommended in the pattern. It was an op shop buy. 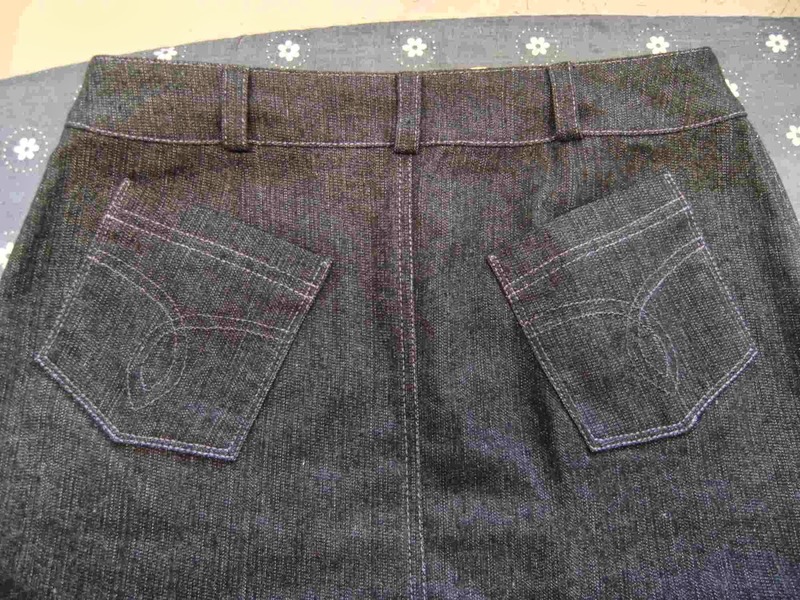 The back pockets are slanted as per the pattern. I like this detail as I think it adds curves - a good thing for me! This skirt was cut out in January this year and has been sitting around since then. 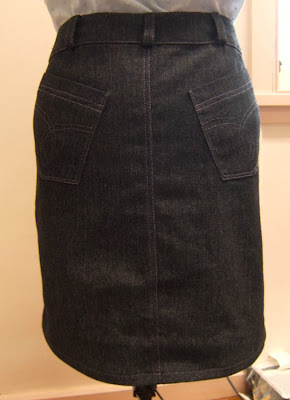 I am on a mission to finish UFO's hanging around my sewing room and this skirt is the first FO since making that goal! I had stored the receipt from the fabric purchase with it. I bought the fabric on sale at Lincraft. I bought 1m and it cost me $7.99 (sale was 40% off). The threads were all in stash, as was the quilting cotton lining the waistband. The buttons had been cut off an old shirt of my DH's and the zip was an op shop buy so probably cost 10c. This skirt is definitely a bargain! And for those who are undoubtedly wondering the shirt is another Ottobre buttondown just the same as this one - here. I am waiting for some ordered buttons to arrive and then I think it will go into heavy rotation in my wardrobe just like the cream one has. I plan to wear this skirt next week as DH and I are taking a few nights off to go to our local wine district for our 25th wedding anniversary. Maybe I will get a photo of it then for you. Very cute skirt and love your pocket designs. Congratulations on your wedding anniversary and enjoy your time away. Great skirt! Very nice fly and topstitching. Well done on the $$ too! I like those angled pockets. I have this issue, you've inspired me to look again at making this skirt! 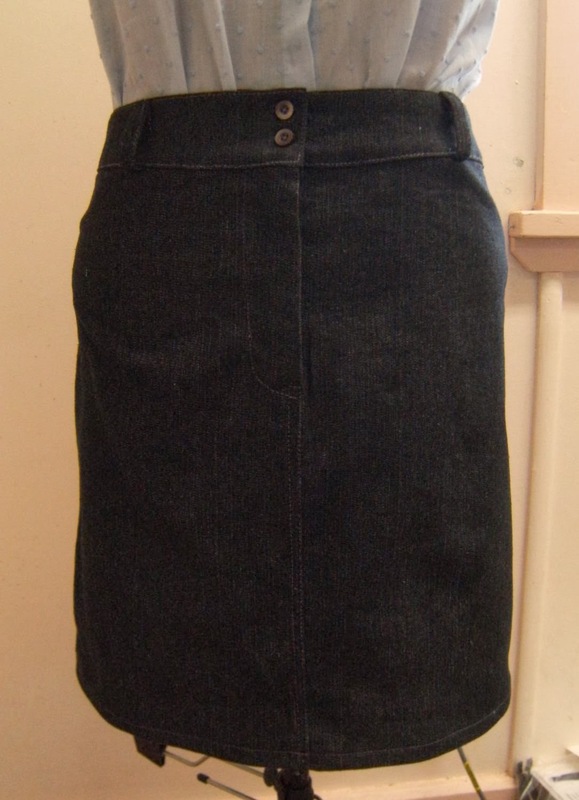 This looks like such a useful little denim skirt. I would wear it and wear it!